But its new retina screen is new thing. And after coming this retina screen a race of computer programmers is start to make new apps for it and can take more benefits from it. This screen gives better results of eBook than printed book on paper. And because of it now it becomes more interesting to play games on it. And by using new app STAR WALK you can view space in a new style and you can 0.3 million stars at a time on screen. Its processor is so strong and you can easily play Nintendo 3D games on it. Apple modifies it app especially for it. And specially apples modify its GARAGEBAND app for music and make it more interesting. And for iPhoto (app) they give shortcut on screen for editing photo directly by cut paste, changing light and for easily adding digital affects. And one of its most useful apps is DIARY, which helps to manage daily life. But in last the problem is that after using it for long time makes it hotter, and this is major problem in mostly hotter countries. • Retina display. As many analysts had predicted, the screen of the iPad 3 will have a sharper resolution than that of its predecessors. The display will have 3.1 million pixels. • A faster processor. Whereas previous Apple tablets contained a dualcore processor, the new iPad will be powered by a quadcore one called the A5X. • 4G LTE. 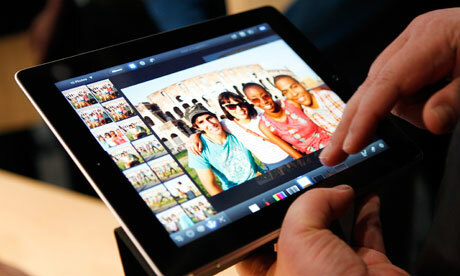 Previous iPads have been confined to 3G networks. This gadget will have 4G LTE capabilities, meaning it will allow for faster downloading speeds. • Improved camera, video capabilities. The new iSight camera will be 5 megapixels. • Voice dictation. This feature will be available in English, French, German and Japanese. • New color choices. Before today, all iPads had a sleek silver shell. Today, chief executive Tim Cook said that the latest version will also be available in black or white Accessori Apple. € 19,00One thing that won’t change? The price. The new iPad will start at $499, as the iPad 2 did before it.